I am sitting on my bed in the hotel room at 6:59 on Friday morning. Unfortunately I have been awake for hours. Even though I was extremely tired last night I did not sleep well. A11, on the other hand was asleep within minutes of lying down and slept all night. Our flights were both uneventful, we were fed(three times), entertained and some of our travellers slept. After collecting luggage however we discovered one of the chaperone’s suitcases had not arrived, hopefully it will turn up today. We went straight from the airport to the Eastman violin factory, where the workers were working extra hours just so that we could see them in action. 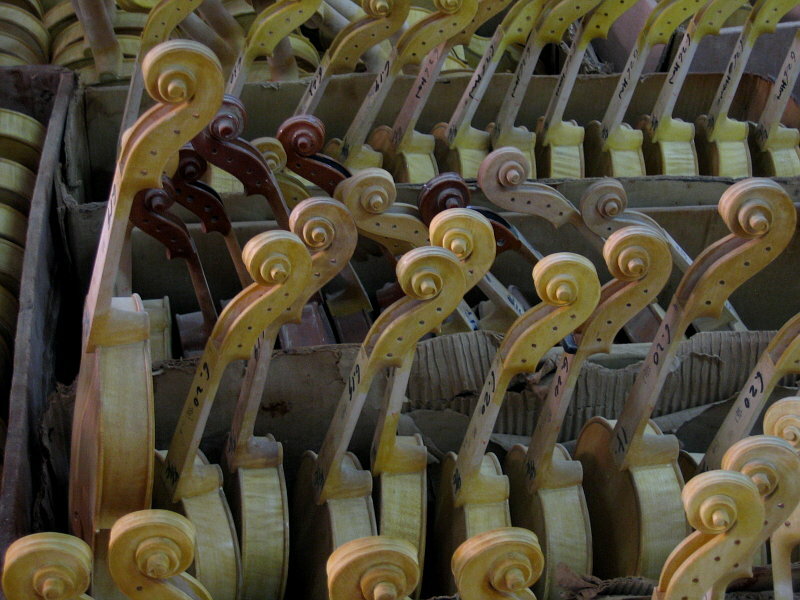 Each violin, cello or double bass is made in an assembly line fashion, with all the workers repeating their own well mastered task over and over. As we moved from room to room we were greeted first with the smell of wood and later with the strong smell of stains and varnish. It was eye opening to see the many steps and the patient care each person was taking on their given task. The hotel is very comfortable and the food is great. This entry was posted in China, Music on July 4, 2008 by Heather. So glad to check in and see your smiling faces all the way from China. You look a little hot – I’ll have a swim for you tomorrow. We continue to pray for you everyday. Enjoy!! !